1. Preheat oven to 220C or 200C fan-force. Place 1 large baking tray in oven. Place McCain Roasts on hot tray. Roast for 30-35 minutes or until crunchy. 2. Meanwhile, hard boil eggs: Cover eggs with water in a small saucepan and boil for 6 minutes. Drain. Cool in cold water. Peel when cool enough to handle. Cut into quarters. 3. Meanwhile, combine oil, mustard, vinegar, capers, echalot and herbs in a large bowl. 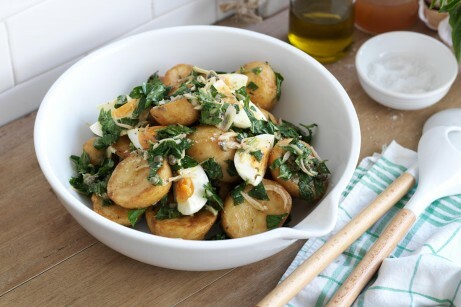 Add roasted potatoes and eggs; gently toss to coat. Serve immediately. 1 Preheat oven to 220C or 200C fan-force. Place 1 large baking tray in oven. 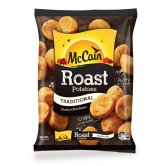 Place McCain Roasts on hot tray. Roast for 30-35 minutes or until crunchy. 2 Meanwhile, hard boil eggs: Cover eggs with water in a small saucepan and boil for 6 minutes. Drain. Cool in cold water. Peel when cool enough to handle. Cut into quarters. 3 Meanwhile, combine oil, mustard, vinegar, capers, echalot and herbs in a large bowl. Add roasted potatoes and eggs; gently toss to coat. Serve immediately.